Yesterday I posted a review of Stephen King's 11-22-63, novel about a time traveler's attempt to prevent the assassination of President Kennedy. The early 1960s were, obviously, a quite different time, before the Civil Rights Act and the sexual revolution and long before the fall of Communism. King captures the striking differences very well. But I recently saw something that illustrates (literally) how much remains the same, or has at least circled back around again. 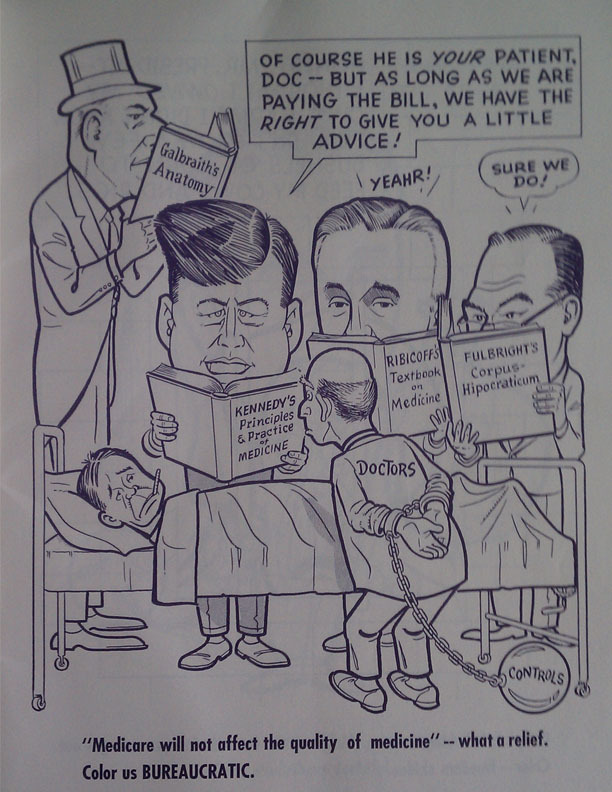 A reader at the Talking Points Memo website has provided a number of pages from something called the New Frontier Coloring Book, an attack on President Kennedy in the form of depressingly humorless cartoons. Medicare, its critics insisted, would be the end of America, or at least of freedom. In 1961 no less a conservative than Ronald Reagan recorded a speech (which you can listen to on YouTube) attacking the very concept of Medicare as "socialized medicine" and warning that if the public did not urgently rise up and prevent its passage, "one of these days you and I are going to spend our sunset years telling our children, and our children's children, what it once was like in America when men were free." Not only does this sound an awful lot about today's rants against the Affordable Care Act, Reagan's words have actually been invoked by the ACA's opponents, who are of course careful to omit mentioning the popular program Reagan was really talking about. In the early 1960s lots of cranks called JFK a Communist, but at least at the time Communism was a real threat. What's striking is that even today, with Communism about as current a menace as the Visigoths, they can't come up with anything new, resorting to the same empty name-calling toward a president who's barely a moderate liberal.